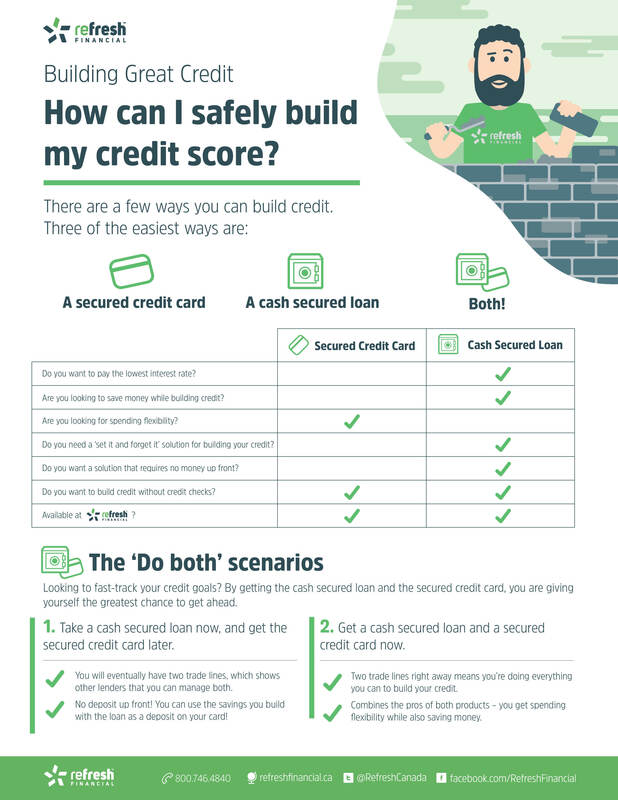 If you’ve struggled with credit for any amount of time, you’ve probably heard, more often than not, that getting yourself a secured credit card is the best way to build credit fast. Being as you’re here, on the Refresh Financial site, you’ve probably also heard about the quick credit boosting power of credit building programs like secured savings programs. So, which method is better and how do you decide which to use? A credit building program, like that which is offered by Refresh Financial, is an extremely low-risk method of rebuilding your credit that requires no up-front cash and will report your on-time payments to the credit bureau just like an installment loan. As you pay interest, the credit bureaus see it as an installment loan trade line. And, after you've paid off your initial commitment fee, you begin to build your savings. So, not only do you get to boost your credit significantly, but you also get to kick start your savings or use the money to pay down your other debts as well. The pluses that a credit building program has over a secured credit card are: 1. No up-front money and 2. You end up with some cash at the end. A secured credit card is when you put money down to act as collateral for the credit you’ll be given on your card. Should you default on your payments, the lender can then keep your security funds. It lowers the risk for the lender and enables people who have poor credit to begin to build their credit again. Just like a non-secured credit card, all your usage and payment habits are going to be reported to the credit bureaus and your credit will be affected, although not quite as much as an unsecured card, due to the lower risk involved. The upside to a secured credit card is that you have access to revolving credit and increased spending power, though you need to be careful about that, ensuring you don’t accumulate any more debt that you can handle. It’s clear that both of these methods have their upsides, and depending on your personal financial needs, one might sound more inviting that the other. And they both will improve your credit score if you keep up with your payments. However, a secured credit card, due to the low risk involved, will not boost your credit score as much as a credit building program, which reports as an installment loan to the bureaus. And it's important to remember that if you miss payments and accumulate debt quickly with either of them, you’re going to see your score drop. So, the conclusion here is to use what works best for you and remember to keep up with your timely payments. There is one way to get more from each of them, though: Use them together. Together, these two methods of boosting your credit score are going to be even more speedy than if you choose just one. You’re going to diversify the types of credit you have by having one revolving credit account and one installment credit account. You’ll also have double the amount of on-time payments to report to the credit bureau. As long as you keep any other bills and borrowed funds in good standing, your credit score won’t stay low for long.